Challenge #4: Add something childlike (not necessarily childish) to your workspace or home. Like Jason, I had a tough time coming up with a place I haven’t already adorned with something childlike. My workspace and home are one and the same thing. I have a bookshelf in the living room simply riddled with children’s books and young adult fiction, as well as stuffed animals and toys. In my bedroom, Yoda smiles knowingly at me all day long, and even in my kitchen I have Smurfs magnets all over my fridge. I thought about putting something in my car, but then I remembered Dastardly Jim, my pirate antenna topper (he doesn’t fit on my antenna, so he hangs out in my car). So, is there a spot in my house that could use a little childhood cheer? Why, yes. Yes, there is. Two spots, in fact: My shower and my walk-in closet slash vanity. I have a rubber ducky that I placed up in the corner of my shower. Every morning as I wash my hair I’ll look up at him and giggle! From left to right we have my High School Musical locker ornament that actually plays “We’re All in This Together” when you open it, my skateboarding alien, the Scarecrow whom I lovingly refer to as Fiyero, Scooby-Doo bobblehead, my pet rock Ben, my pet rock Andrew, a bunny my Mommy made me one Easter, my Pet rock Joseph, my pet rocks Starky I and II (barely visible), Elphaba (some of you may know her as the “wicked witch”, but to you I say click here), Han Solo brandishing his blaster, and my wooden whistle Bill the Basketball Player. Dang, I’m so cool! 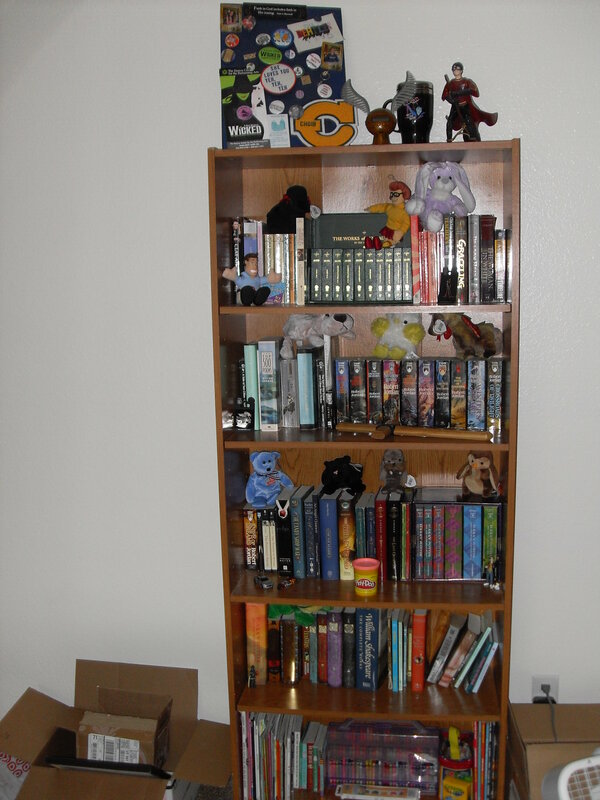 And I have teddy bears, pandas, and other toy animals, also a big “Muggles for Harry Potter” poster and framed illustrations from the original Winnie-the-Pooh books and The Tales of Beatrix Potter. And in the kitchen, mugs with pictures of animals and Disney characters. The bubble bath I buy tends to be illustrated by pictures of Mr. Bubble and characters from Sesame Street and Toy Story. I’m retired, so I don’t have a real “workspace” except for the table where my computer is (oh yes, I have a Harry Potter “persona” decorating my Firefox browser). It’s the Han Solo figure that confirms your coolness. It’s true. Han Solo is the epitome of coolnees. I mean, he’s the reason the Empire went down. Luke? Please. He was a wuss.